My father zt”l always told me that until I understood what motivated some Japanese during WWII to slice open their stomachs in order to protect their pictures of Emperor Hirohito, would I understand what it means to relate to God as king. I tasted the experience in the Hermitage museum in St. Petersburg, Russia. Only royalty could see the art. There is a hallway one must enter as he approaches the main throne room that serves, even now, to intimidate anyone who passes through it walls. The sound of your footsteps echoes and bounces around you, increasing in volume as you approach the Throne room. The armor displays are intimidating. And then, one enters the throne room. The floor and the ceiling match to teach that the Czars power on earth matches God’s Power in Heaven, and that his reign is Divinely granted and blessed. The room, the rhyme and design, were my first true taste of the greatness of a king. The people who lovingly built, passionately shaped, and devotedly layered the Mizbei’ach, were not only building an altar, they were building the Heavenly Altar so powerfully described by Moses to them. This is what the Midrashim and Zohars mean when they speak of God observing the Mitzvot of the Torah, or of God studying Torah with us. The Sages want us to give Tzedaka the way “they” give Tzedaka in Heaven. They want us to not simply open a book and study Torah, they want us to picture the Almighty sitting in the Yeshiva in Gan Eden, studying Torah, and then to desire to study with the same passion and clarity. The Sages want us to imagine what Shabbat is like in heaven and to then, not simply observe the Shabbat, but to make a Shabbat Table that is just like God’s Table in Heaven. 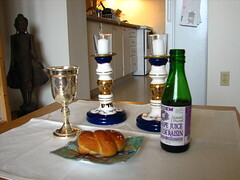 To sing as the angels sing at the heavenly Shabbat Table. To discuss important ideas as they do at the table at which God is sitting at the head. Ours is not just Shabbat, it can be the replica of God’s Shabbat shared with His angels.